An upper slide splits into several flows and pours off a steepening, rounded rock face, with a few small free-falls at the very bottom. The rock is covered in green moss and algae, and the surrounding glen is lush and green. Looks best in periods of above-average water flow. Parking is in downtown Blowing Rock, NC off of US Hwy. 321 Business. You can park in a small lot right at the trailhead, at a nearby parking garage, or really just anywhere downtown and walk a few blocks to the trailhead. From the intersection of US Hwy. 221 and 321 Business, go south on Main Street/321 Business for 2 blocks and turn right on Laurel Ln. Go straight through the 4 way stop sign at Wallingford St. and turn left into the parking area just beyond (you'll see Mayview Lake just up ahead on the right). If that small lot is full, go back to the 4-way and turn left on Wallingford. A parking garage is just ahead on the left with plenty of spaces. 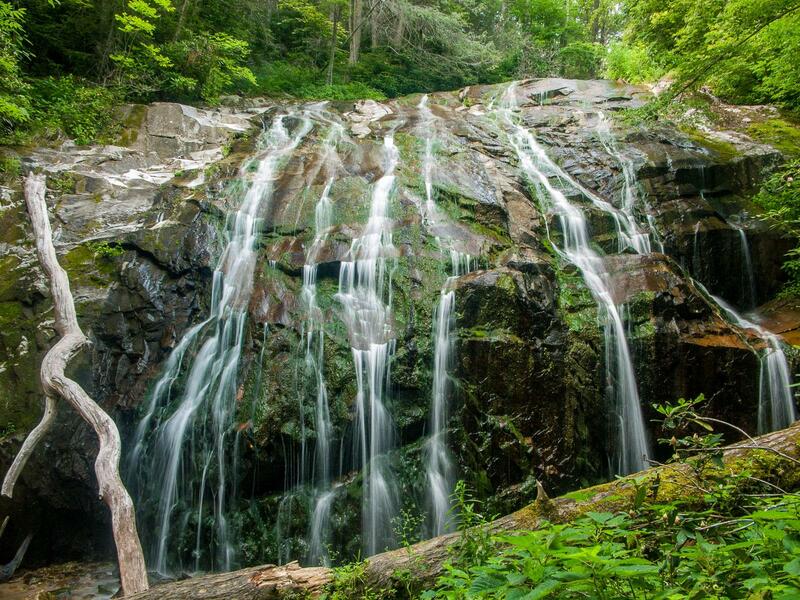 The hike to this falls is about 2.5 miles round trip by itself. But you'll want to continue on down the trail to Glen Marie Falls while you're here, which makes it just over 3 miles round trip. It's not really small-kid friendly and it's surprisingly steep on the way back up, but it's great exercise! This is a pleasant hike once you get past the first 1/4 mile or so. From the small parking lot for Annie Cannon Park, the Glen Burney Trail begins as an old gravel road leading downhill. A small tributary trickles under a culvert by the parking lot. You'll reach a fancy sign announcing the trail's name on your right. The piece of trail behind the sign makes a rough descent, crosses the creek on a broken bridge, turns left, and becomes a rough, muddy path overgrown with stinging nettle. Then it joins back to the gravel road you started on in about 50 yards. So skip it! Instead, continue straight on the gravel road and cross the creek at a easy culvert. The useless little piece of trail joins back in on the other side of the culvert. Continue straight on the old gravel road, which is level now, and goes through a forested residential area. The creek drops away, and some big houses cling to the hillsides on either side. The creek is very small at this point. Unfortunately, since it flows out of town and Mayview Lake just upstream, the water is a bit silty. The trail comes out in a small clearing and then begins descending steeply through switchbacks. At the final switchback, you reach the old sewage treatment station dating back to 1929. All that's left is a concrete shell with some pipes sticking out. Luckily, sewage is no longer treated and dumped into the creek here, above the falls. The trail gets back down to creek level and starts following it downstream. Shortly, you'll cross the creek on a footbridge. The trail continues downhill, with some steep drop-offs on the right in a few spots. Some large, dead hemlocks still stand in the woods, and there are no more houses the rest of the way. You'll pass a few small cascades, and then reach one with a name on your right, called - wait for it - The Cascades. The name is announced by a sign at the top. Continue down the trail - the view of the little waterfall is partially obscured by trees. But a few tiny tributaries have joined in to New Year Creek by this point, so there is more water flow and the water is clearer too. Glen Burney Falls from the top. Continue downhill a short ways. A side path to the right leads about 100 feet to an observation deck with rails at the top of Glen Burney Falls. A picnic table, overgrown with trees, is along the side path. The view down is pretty nice here - you get a sense of how steep this drainage is and how far down it is to the bottom of the falls. Be safe and stay on the observation deck. To reach the bottom of the falls, continue down the Glen Burney trail and around another switchback. The trail reaches a T intersection; go right. You'll come out at the base of the falls after just a short distance. Return to your vehicle on the same path, or continue down the Glen Burney trail about 1/4 mile to reach Glen Marie Falls.